I recently came across an interesting article on meditation in the Art of Healing magazine. The article highlighted two recent studies that found significant benefits in practising meditation. 1. A new imaging study found that people with no prior meditation experience showed changes in particular brain mechanisms when they participated in a four-day mindfulness meditation program. In particular there was a marked decrease in the presence of anxiety after meditation. 2. A new study published in the Journal, Circulation: Cardiovascular Quality and Outcomes found that the practice of meditation keeps people healthy. The study involved a group of 201 people suffering from coronary heart disease. They had a choice between a health education class or take a course in transcendental meditation. Over a five year period, researchers followed up with both groups and found that those who took the meditation class had a 48 per cent reduction in their symptoms and overall risk of heart attack, stroke and death. Join Simon Low and select Yoga Academy teachers for a range of exciting yoga teacher training workshops located in the UK and Thailand. Visit Simon Low’s website to see the complete schedule of upcoming teacher training workshops. Simon Low’s next 2-year course at his residential venue Commonwork Farm near Sevenoaks in Kent begins on 15 November 2013. Visit the Yoga Academy website for more information and to book. Samahita Retreat on Koh Samui, Thailand, is the venue for The Yoga Academy’s Yin and Yang Yoga Teacher Training and Study Immersion, with Yoga Alliance 200-hour certification, now running for the fourth consecutive year. Founded and led by Simon Low, one of Europe’s most renowned yoga teachers, The Yoga Academy is considered by many to be the most highly respected yoga teacher training school in the UK providing in-depth education in the full spectrum of yogic studies. 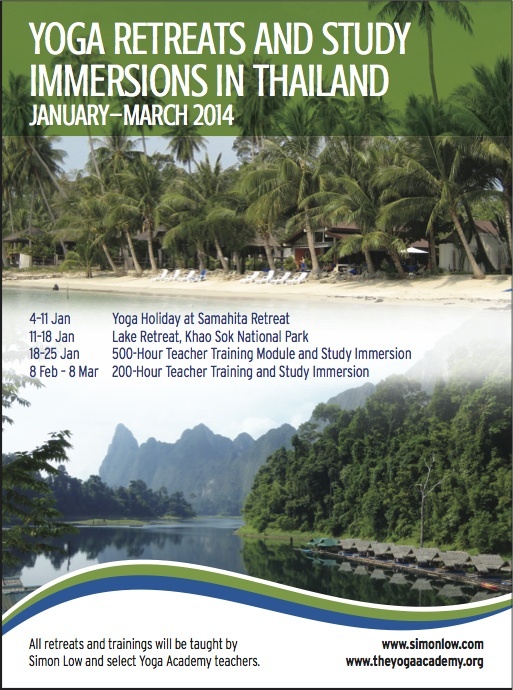 Held at Samahita Retreat, Koh Samul Thailand from 18-25 January 2014. Visit Samahita Retreat’s website for more information and to book. Simon’s annual ongoing Training for Teachers weekend at our homely training venue Commonwork Farm in Kent, UK from 22-24 November 2013. Join Simon Low and select Yoga Academy teachers in 2014 for your choice of yoga holiday, lake retreat or teacher training. All events are based in Thailand. Visit Simon Low’s website for more information and to book. For more information about the prenatal yoga teacher training with one of our teachers – Katie Manitsas – click on the image below. Katie runs a weekend workshop twice a year, also called ‘The Yoga of Birth’, which trains yoga teachers to teach pre-natal yoga. It is also the title of Katie’s popular eBook ‘The Yoga of Birth’. The training is taught by Katie and several guest teachers all of whom are leaders in their fields related to childbirth. If you attend the training a copy of the book is included free of charge. The next training runs August 24th and 25th 2013. Details can be found at www.jivamuktiyoga.com.au or email katie@jivamuktiyoga.com.au.